The World is What we Create | Run Inspired. I’ve been struggling with what to write about today. It’s been a few days since I posted and I’ve had a hard coming up with something of value to say. That was until earlier today. And it has absolutely nothing to do with running and only a small percentage to do with my injury. This morning I woke up and decided to check the news. It’s not something I normally do, primarily because I don’t want to let negativity into my mind. If I don’t have negative thoughts of the world then I can’t spread negative thoughts to the world. At least that is my opinion. When I first checked the local news, I read about a series of shootings in Myrtle Beach. Then I checked CNN and learned for the first time about the mass shootings in California. My heart became heavier and heavier as I read through the tragic events of Friday night. As I drove to the grocery store, I cried just thinking about all of the pain and sadness that exists in our world. Why are some people so angry? So sad? So mean? Then I came home and checked the mail. When I opened the mail, I had a very interesting envelope and I wasn’t quite sure who it was from. Inside of the envelope there was another envelope and a card. 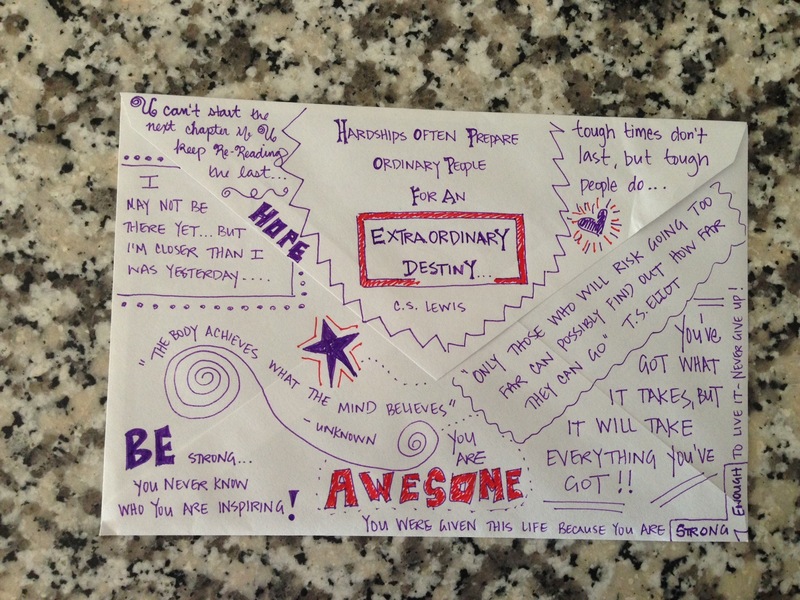 The envelope was covered in inspirational quotes and as I read every single word, I was completely overwhelmed. Not only did every single word on that envelope speak to my heart, but the fact that a friend who I haven’t seen or talked to in a few years, had taken the time to do something so kind, reminded me that the world is good. Then I started thinking about all of the other people who had reached out to me during this hard time, people who I don’t see or talk to that often. Just last week I received an extremely kind and heart warming card from my former dance teacher. It was totally unexpected but it made me so happy. Then I realized that because these people had done something so kind for me, I wanted to share that feeling of happiness with others. I want to do more good because of them. I want to take the compassion and kindness that has been shown to me and pay it forward. Then I had another thought relating back to earlier in the day… the world is what we create. I believe in energies. I believe some people emit positive energies and some people emit negative energies. I also believe that our world is a balance, yin and yang. However, if our only thoughts are negative, if we stop believing in the good of people and humanity, if we talk badly about our neighbor, if we can’t have compassion for the stranger on the street, if we can’t slow down long enough to realize we are all human beings who want to belong and to be loved, then we are creating a world with little hope. That is our doing. But if we can have compassion for all, do a random act of kindness for the stranger down the street, spread a little love, and start filling our head with good thoughts, then we are creating a world full of hope. That also, is our doing. I choose to believe in goodness. I choose to believe that humanity is good and the world is full of hope. This morning, as I was struggling to comprehend what happened Friday night, a letter from a person who I haven’t seen in years, reminded me that kindness exists all around us. That is a reminder we all need. Let’s create a better world. Be kind to yourself and be kind to others. What the mind believes is what will come to pass. Believe in something better for humanity. Thank you to everyone who has shown me so much love and support during this past month. I am forever grateful for your kindness and I will do my best to pass it along.